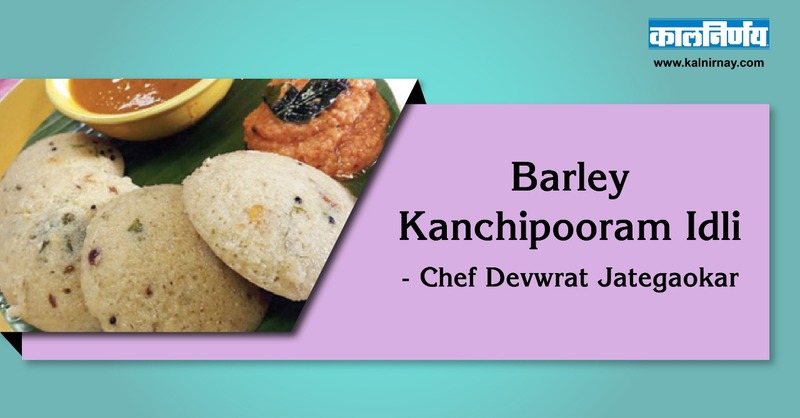 For batter : Barley daliya – 11/2 cup, Urad dal – 1/4 rth cup, Chana Dal – 2 tsp. Other ingredients : Curd – 1 cup, Sooji – 1/4 rth cup, Salt, Fruit salt. For tadka : Butter, mustard seeds, chana dal, ginger grated, crushed black pepper, cumin curry leaves, cashew nuts and green chillies. To serve : spicy coconut chutney, Melten butter, banana leaves. Soak the mentioned ingredients for four hours and grind to paste. Keep aside for 5-6 hours at room temperature for fermenting. Add tadka to batter. Add 2 tsp curd and and 1 tsp of fruit salt. Immediately pour in oiled idli molds and stream it for 12-15 mins. Serve hot with coconut chutney and sambar. Note : It is ideal for weight loss, fibre, with lot of vitamins and minerals, barley is powder house of vital nutrients, fibre and antioxidant. Very good during pregnancy.